Spread in the communication world of taiko! 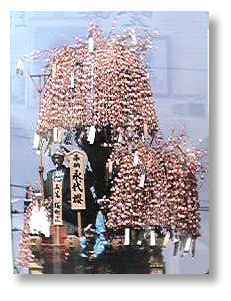 The main event of "Mikuni-Maturi" is offering "Dashi" (festival car) every year of May 20, and six "Dashi"s parade in the neighborhood. The duty of "Dashi" is taken by the quarter's turn of the year. In complaince with each of quarters, there is taking the turn (once 3 years, once 6 years, once 12 years) . 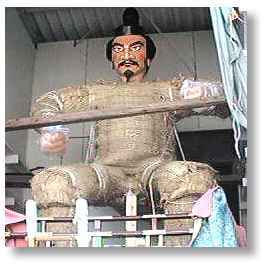 Mikuni's "Dashi" is often a doll brave warrior with under the seats for "Hayashi-kata", and it stands about 18 feet (5.5 meters). On this ground this town's electric wires are higher than other town's one. 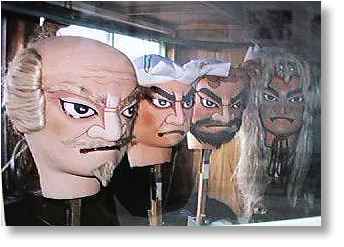 The models of the year's (2000) "Dashi" dolls were the following warriors & heroes of the Kabuki. By the way, those "Dashi" dolls give place to the new every turn & every year. And one quarter's "Dashi" is making cherry trees instead of the doll warrior every turn. All most of dolls warrior are made by only "Ningyoushi" (only person who can be making dolls warrior in Mikuni). In complaiance with the quarter, it was made dy the quarter's young man group. 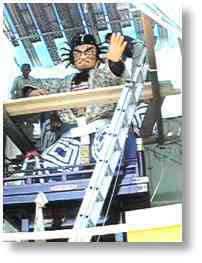 Price of the doll warrior is about from 5 hundred thousand until one million yen.